Embattled 'Colonel' Nick Clegg today rounded on his critics claiming that he was much loved and that it was outside agencies that were spreading rumours of protests. He also refuted ideas that he was no more than the honorary leader of the LibDem people and urged his coalition to “capture the rats” threatening Downing Street. "No-one is against us. Against us for what? Because I'm not a leader. They love me. All my people are with me, they love me all, no one is protesting against me, the thousands outside this hall in Sheffield all love me.” explained the self-styled Deputy Prime Minister. 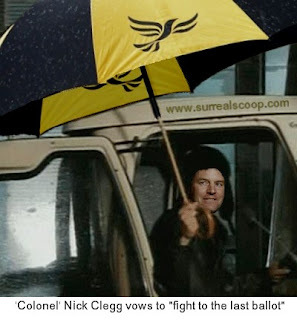 ‘Colonel’ Clegg, whose regime of terror began when he held 60 million people hostage for 6 days in the summer of 2010, denied that he was ever the leader of the LibDem people, especially after 3pm. In his rambling, incoherent address he was at great lengths to support those seeking greater representation. During his hour long, rambling, televised speech, ‘Colonel’ Clegg said that up and down the land, in pubs and clubs, at the school gates or in Facebook chats, the only thing that mattered to people was the move to the Alternative Voting system.